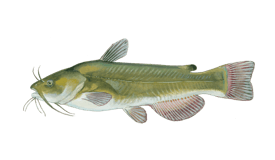 Bullhead are species of Catfish native to North American fresh waters. They are abundant and, even though they're quite smaller than their relatives, are popular game and table fish. There are three major types of Bullhead - the Black (Ameiurus melas), Brown (Ameiurus nebulosus) and Yellow (Ameiurus natalis). Despite their names, color is not a good distinguishing factor. The species boast a common pair of recognizable barbels pointed upwards, by which they get their root name. The three species are similar in size, with the Black Bullhead being somewhat larger on average than the other two. 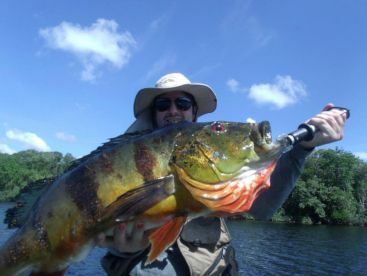 Most catches are between 8 and 15'' and up to 5lbs. 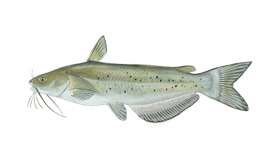 Black Bullhead can be found throughout the Great Lakes and St Lawrence River, but also natively in southern Ontario and throughout the central USA and non-natively outside this range. Brown Bullhead occurs in the eastern USA as far as Alabama and in southern Canada. It has also been introduced throughout the continent. They live in deeper waters than other species. Yellow Bullhead can be found in the central and eastern USA as far as western Texas. They have been introduced elsewhere, too. They prefer shallow and weedy waters. Bullhead are caught regularly from the shore. Good baits include homemade dough, special Catfish stink bait, corn, worms or small pieces of minnows or frogs. These can be fished on a slip-sinker rig with a bobber. During spring, Bullheads will be in shallower water, during summer in deeper and during fall the depth is unpredictable. All three make for great table fare.